1. Cut sausage into tiny pieces and fry in oil until browned. 2. In bowl add sausage, garlic powder, soy sauce, onin, salt and pepper. Blend well. 3. 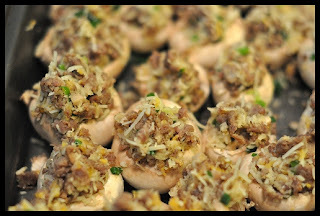 Spoon mixture into mushrooms. 4. Bake for 20−25 minutes at 350.